The city of lights was illuminated by a fulmination of euphoria and devastation. For PSG, it was re-inoculation of the stingiest venom from the familiar poisoned chalice and for Manchester United, it was a tryst with scenes of jubilant pandemonium. Doing it the United way, an injury-time penalty sealed a trip into the forgotten lands of Champions League quarterfinals for the first time since Sir Alex. The Ole Revolution has emboldened the Club to reclaim its European pedestal months after being put on life support at the hands of one Portuguese import. The game itself was littered with defensive shambles, a goalkeeping howler, few pieces of glorious opportunism and a divinely ordained intervention of VAR (Video Assistant Referee). United scored early with Lukaku capitalizing on a Kehrer-back pass. Bernat leveled after Bailly went sleepwalking for United. Lukaku regained the lead latching on to a spilled Rashford shot by Gigi Buffon. There were some close shaves for United in the second with Mbappe losing his footing in a one-on-one with De Gea (Bernat hit the post from the loose ball) and Di Maria scoring from an offside position. However, it was a Kimpembe handball in the 90th minute that brought the house down at Parc Des Princes. For United, it was glory. For PSG, it was all debris and rubble. PSG have written an invidious history of misfortune after continual implosions at the business end of the trophy they crave and spend billions for but it is the Mancunians who sprinkled the magic dust in the competition already boisterous after the end of Madrid monopolization. After the first leg humbling, a cacophonous clamor of reality check was plastered all over column inches and internet giga-bytes. The response was equally emphatic if not more. United became the first ever away side to overcome a 2 goal deficit from home leg. PSG, of course, had the infamous bottle-job against Barcelona (losing 1-6 at Nou Camp after 4-0 win in Paris) a couple of years ago, but the specifics of this loss would be even more gut-wrenching and unpalatable. 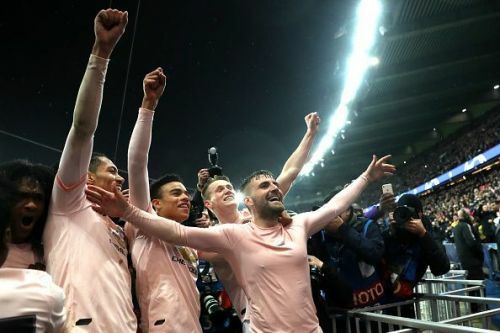 Even though PSG gifted United two goals and conceded a late penalty, the credit must go to the warriors in Pink who harried them and impelled them to falter. United made their own luck while PSG played out their worst nightmare in Parc Des Princes. The Solskjaer's saplings provide a battery of teenage tyros! Staying true to the ethos of the Club, United won in extra time and against all odds. One of the traditions of the club is to blood in the youngsters if they are good enough, no matter the age. 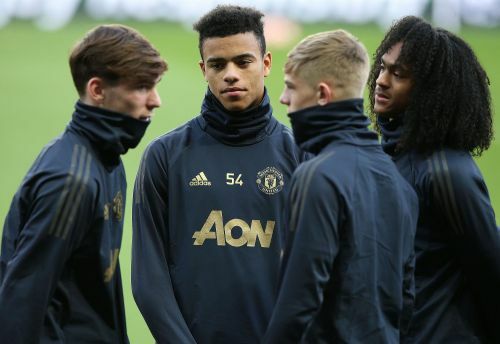 Consequently, United gave a debut to 17-year-old Mason Greenwood and a European debut to 19-year-old Tahith Chong. Add to the 19-year-old Dalot, 21-year-old penalty hero Rashford, 22-year-old McTominay, and 23-year-old Pereira. The fabric of the club is truly and remarkably hoisted by the new management. 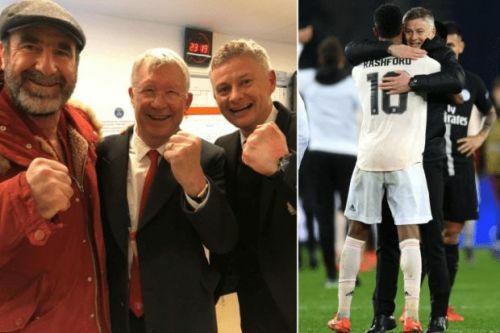 The Solskjaer's saplings have shown a naked disregard for reputation and self-indulgent punditry. The undiluted thrust of youthful optimism and unrelenting gumption seems to put life and hope in place of dread and dejection. The theatre is back with a new dream merchant gashing the ghastly ghosts of Mourinho’s formidable dark dungeons. United had to come up with a plan to stifle the midfield engine of PSG that motored along at Old Trafford. Scott McTominay, Fred and Andreas Pereira were asked to keep close and negate spaces for the likes of Draxler and Di Maria and hound the duo of Veratti and Marquinos. The strategy was well laid out and the players executed it to perfection even with defensive chaos in the firsts 35 minutes. McTominay harangued Veratti all night and Fred brought a semblance of calm and poise on the ball. Pereira and Dalot (replacing Bailly) filled up the gaps on the side of the two center-midfielders making a compact four-man shield. Defensively, United changed from a back five with wingbacks to a flat back four after PSG scored. The forward pairing of Lukaku and Rashford ran their heart out and made hay with scraps to score the three goals on the night. On Wednesday, Paris rained like Manchester and the victory felt like United. The moment of Reckoning bayed for nerves of steel and heart of untrammeled belief. It demanded sacrifice, guts, composure, the audacity to dream and the courage to change the script of fate. It was a product of circumstances but also of brave choices on and off the pitch. The World was watching and the eyes refused to accept. History was made and more importantly, a tradition was upheld; the tradition to overcome adversity and rise to the challenge. To never accept defeat or hide behind excuses. To never cower to fears and succumb to the pressure of the impossible. Paris manifested a Manchester United dismissing the call to be relegated as European afterthought, a moribund din. Ole's United is the new United. A reincarnation of the Old United. The United of Busby. the United of Fergie. The United that will never die.